Click on Photos to Enlarge. A genuine Scottish atmosphere was lent to Knox Men’s Club celebration of “Robbie Burns’ Night” by veteran Scot, Duncan Cowan of Allandale. 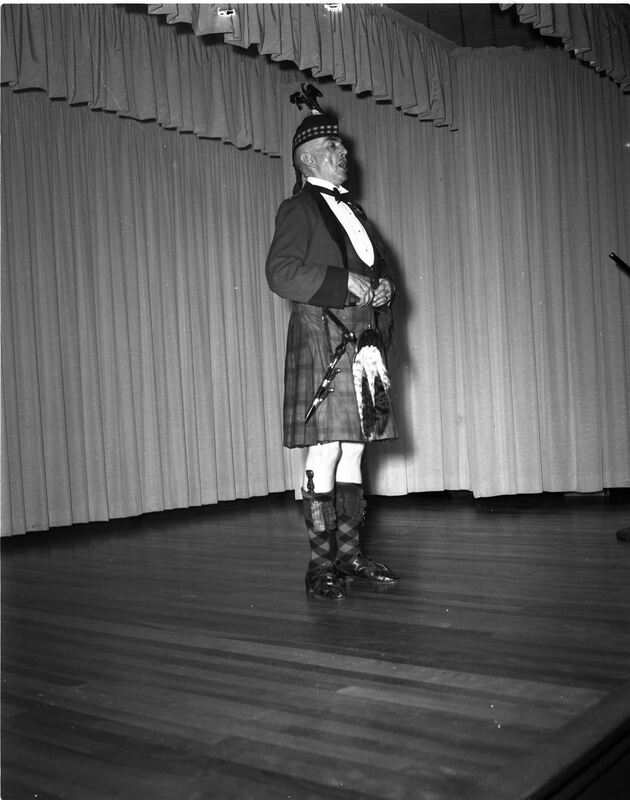 Mr. Cowan is seen above, he sang some of the great Scottish bard’s immortal songs. A lively sword dance put members of the Knox Church Men’s Club, right in the mood to observe “Burns’ Night” last Wednesday. 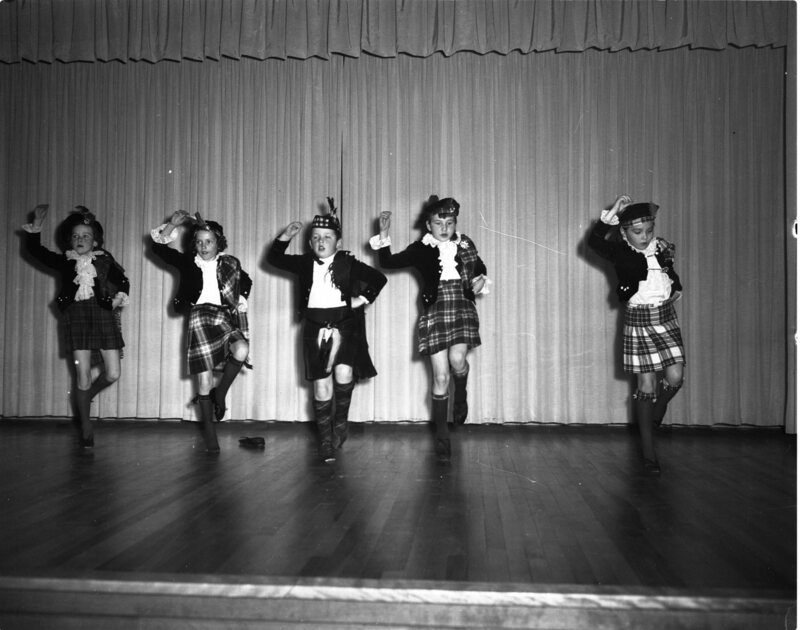 Dancers, directed by Mrs. Audrey McLeod, are left to right Joan O’Hara, Lee Adele Hendrickson, Patsy Woods, and Bonnie Martin. Some of the area’s representatives in county council are seen above in an informal shot prior to the opening of the 1959 session at Barrie Monday. 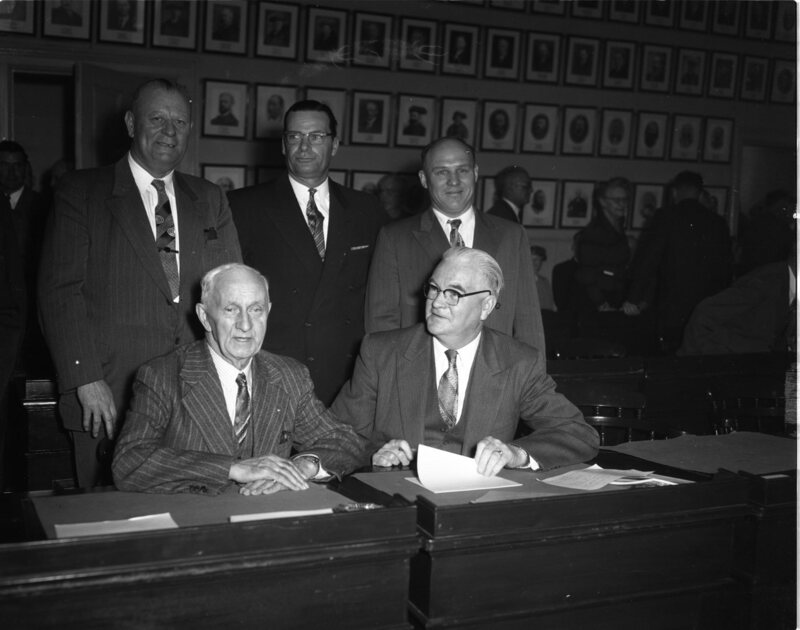 Left to right are, seated, Reeve W. H. Keller, Midland, and Reeve Albert Calvert, Port McNicoll; standing — Reeve Harold Nash, Elmvale, Reeve Montcalm Maurice, Tiny, and Deputy-reeve Bernard St. Amant, Penetang. 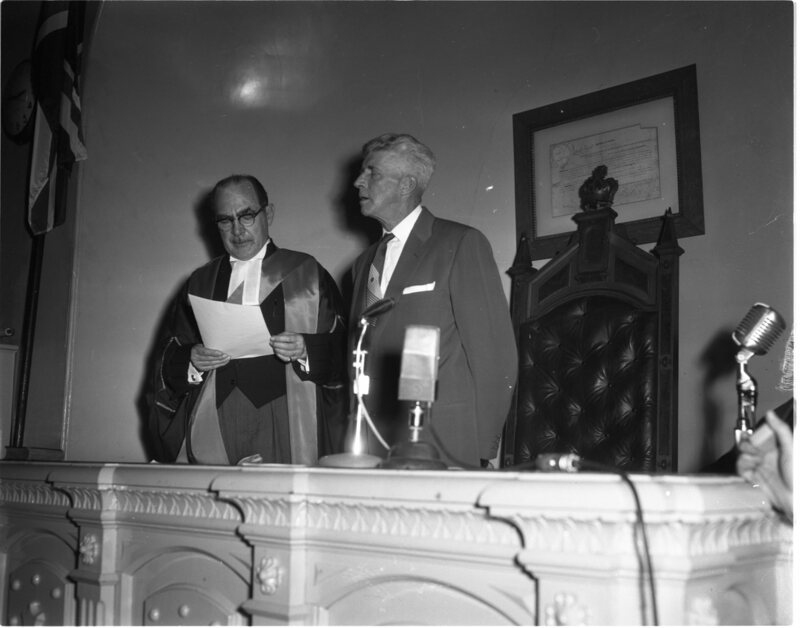 Newly-appointed assistant to Judge J. G. Harvie, Judge D. F. MacLaren is seen, left, as he administered the oath of office to Reeve James Patton of Nottawasaga Township after the latter had been elected Simcoe County Warden for 1959 in Barrie, Monday. It was the fifth try at the office for the veteran reeve. 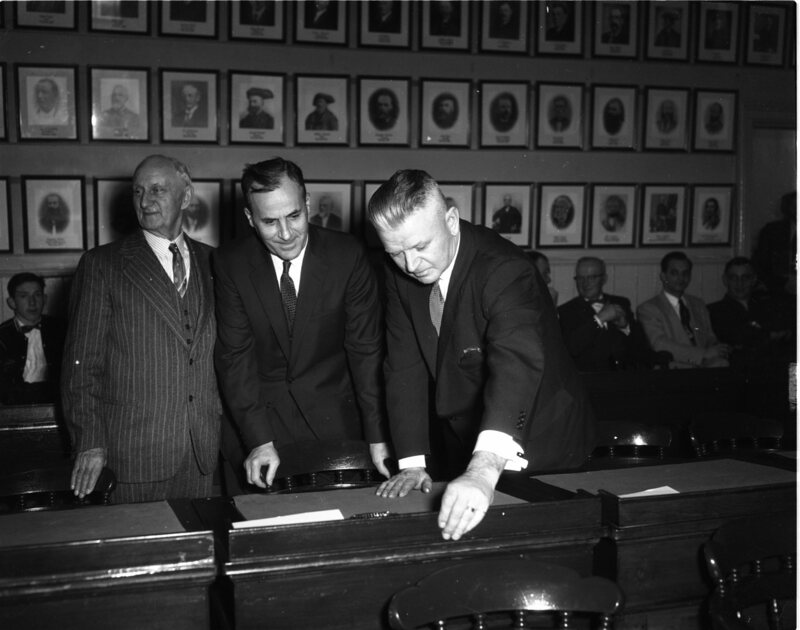 Finding his seat in county council chambers for the first time Monday, Deputy-reeve H. J. Beauchamp of Midland, center, gets help from Reeve W. H. Keller, left, and Ernie Miller. 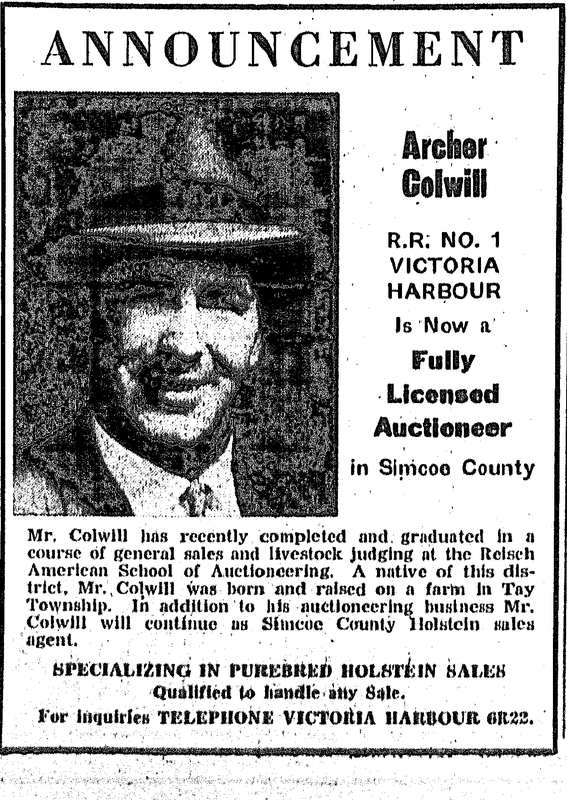 Now in charge of County buildings, Mr. Miller is a former Reeve of Coldwater and an ex-warden of Simcoe County. Looking like the footsteps of some giant who has broken through the ice, these air holes beside the dock at the Midland Simcoe elevator have a real practical value. They are caused by air bubbling up from holes in a submerged plastic pipe and they help facilitate the movement of winter storage cargoes in the four ships at the elevator. 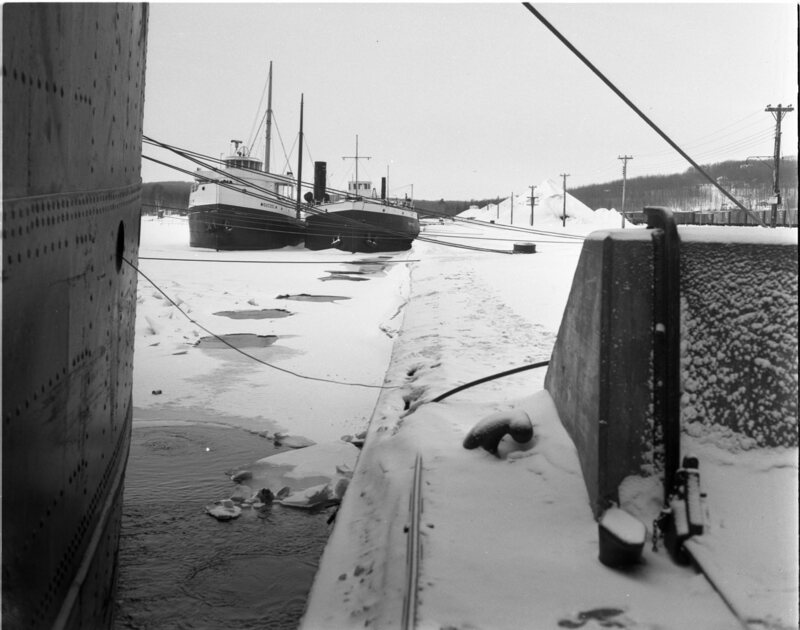 The compressed air method of keeping harbours free of ice is extensively used in Scandinavian countries. Much of the success of the various farm youth clubs in North Simcoe is due to the keen interest of the club leaders. The 4-H Homemaking Clubs are no exception. Leaders of the clubs in this area are seen above during achievement day in Elmvale Saturday. 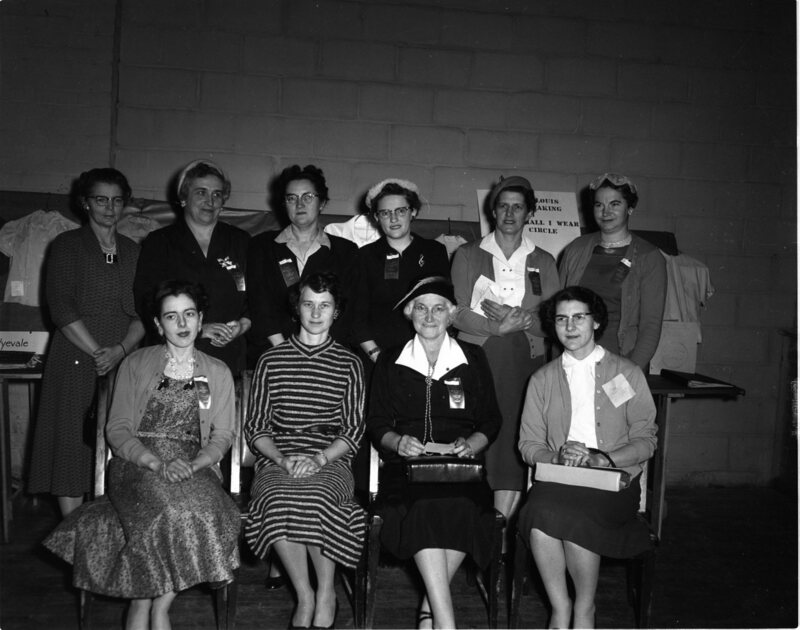 Left to right are, seated, Mrs. F. Coombs, Eady; Miss Mary Wright, Simcoe home economist; Mrs. M. J. Frawley, Mount St. Louis; Mrs. G. Giffen, Edenvale; back row, Mrs. Earl Jones, Vasey; Mrs. Howard Grier, Wyevale North; Mrs. W. Sibthorpe, Waverley; Mrs. Vic Campbell, Wyevale South; Mrs. Gord Strath, Saurin; Mrs. H. Madill, Allenwood. Twenty men were on the job Monday morning as the winter work program got underway in Midland. Some of the men are seen above as they started digging a trench for a new storm sewer on Frederick Street. Another ten men reported for work yesterday and the number will be increased as work becomes available. It was almost 20 below zero when the men started work Monday. Two men above, part of a gang of twenty which found employment at the start of Midland’s winter work program Monday, had to chop through several inches of ice before reaching the road surfaces on Frederick Street. Next foot wasn’t much better as workmen dug through frozen ground to open a trench for a new storm sewer. Representatives of several Midland service clubs met with council Monday night to revive interest in a recreational council. A six-man committee was set up to start the ball rolling. 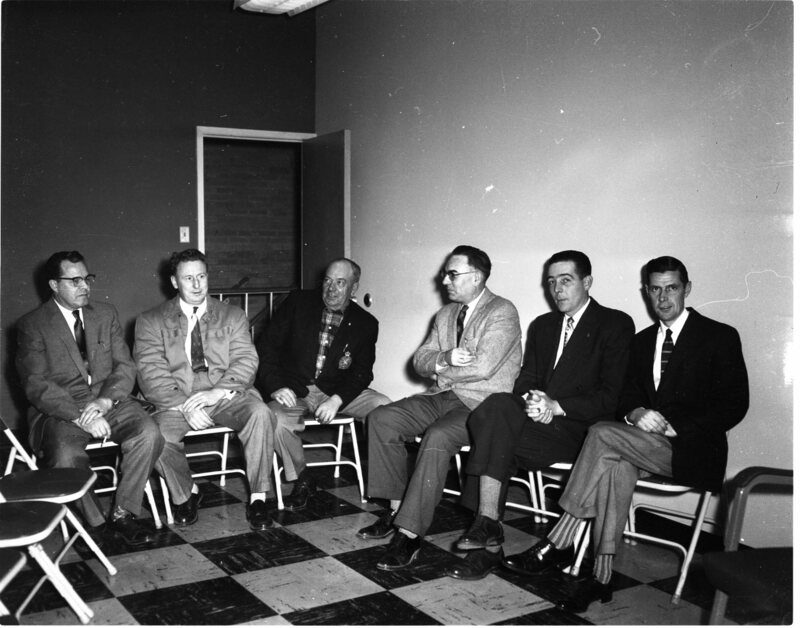 Left to right are; Frank Doherty, Rotary Club; Stewart Holt, Kiwanis; Charles Stewart, band committee; R. B. Moffatt, Lions; Don Galivan, Legion; Fred Howard, Y’s Men’s Club. Midland Jaycees were also represented. Nothing like a game of badminton to keep in trim and dozens of members of the Midland Garrison Club are doing just that twice weekly at the armory. 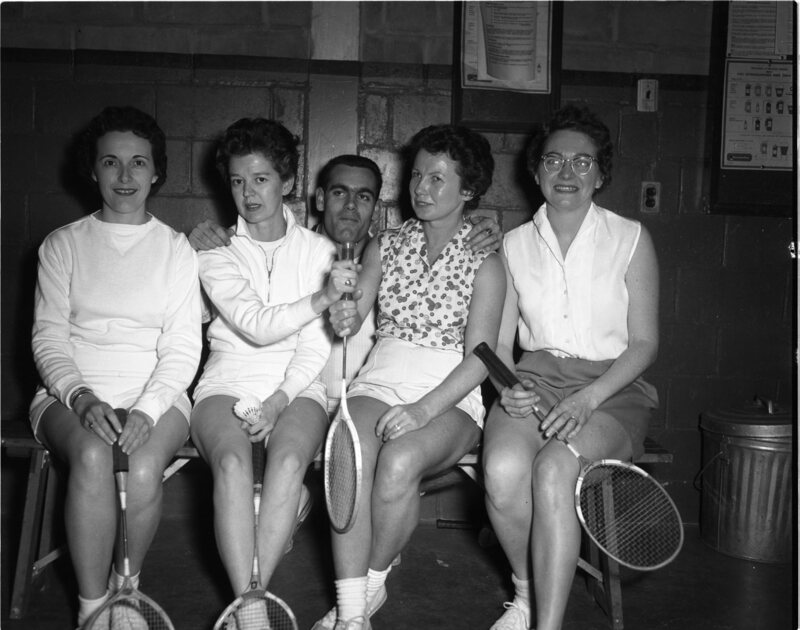 Above, president Jim Lemieux helps four women members choose sides for a friendly match. 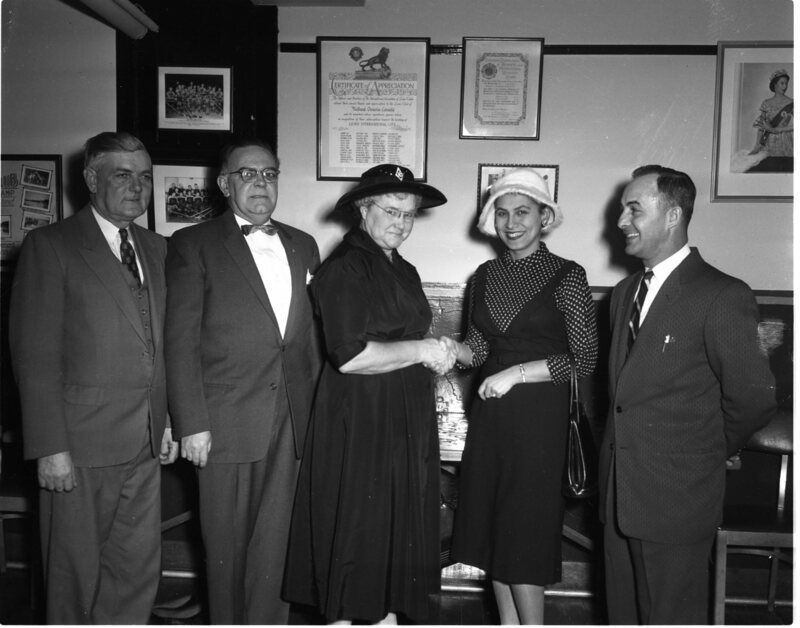 Left to right are; Mrs. Joyce Bowman nee McRae, Miss Joyce Rutherford, Mrs. Robert Berry, and Mrs. Jack Yelland nee June Crawford. Seconds after this shot was taken the ball seen leaving Frank Okenka’s hands swished through the webbing to give MPDHS juniors a short-lived lead against Barrie Central in a COSSA basketball game at MPDHS gym last Wednesday afternoon. Central later rolled to a 23-13 victory in taking two of the three games played that day. Neither County Herald General Manager J. R. Chittick nor Bank of Montreal Manager Wm. Child knows the contents of this letter which contains the fashion expert’s selections in the Pick The Fashions contest No. 1. The contest, being sponsored by the County Herald and Midland business firms, commences today. The judge’s decision is being kept in safe-keeping at the bank. “Minor Hockey Week in Canada” was marked officially in Midland Tuesday night at a bantam-midget doubleheader. In this picture, Capt. 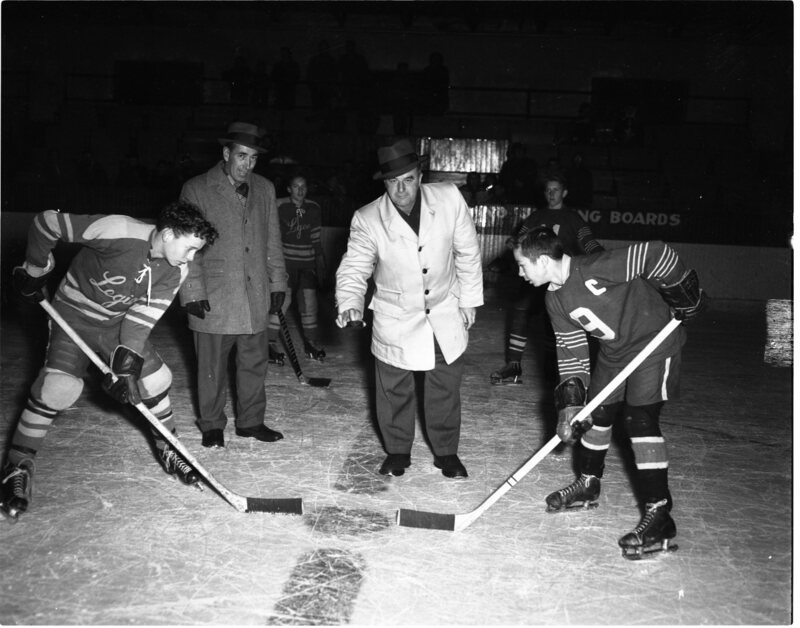 Art Perry drops the puck to start the Bantam game while “Fawf” Wilcox, veteran Midland minor hockey official, watches. Players are Larry Blakeman of Collingwood, left, and Midland’s Ed Zablotny. 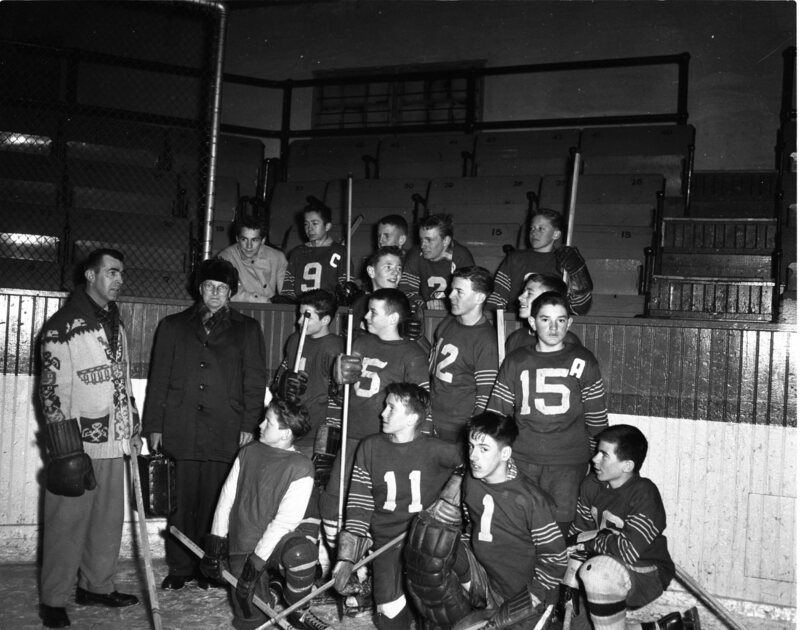 In the lower photo, coach Garnet Armstrong gives his midgets a pep talk prior to the game. It must have been a good one, as Midland won, 6-4. 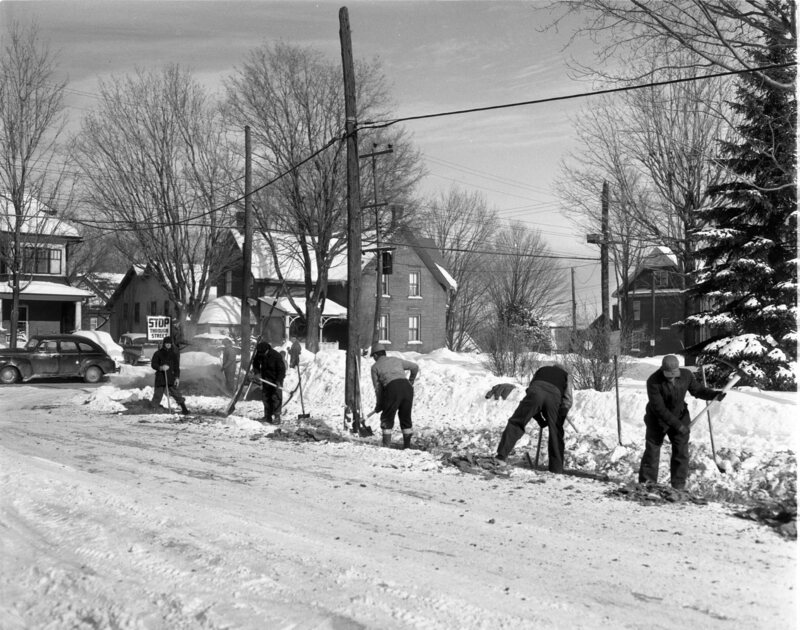 County Herald headline of January 23, 1959; Start Fifty Men Next Week on Winter Work Projects. The first project of a proposed $80,000 expenditure on a winter work program for Midland will get underway next week. Mayor Charles Stevenson told this newspaper yesterday. Mayor Stevenson said between 50 and 60 men would be employed. He expected the work would get underway Monday or Tuesday, and emphasized that those seeking work should apply for jobs through the National Employment Service office in Midland. The work will be under the supervision of the town’s public works superintendent. The initial project, an expenditure of $16,000, will get underway on Mildred and Frederick Streets where sewers and flood control measures will be implemented to drain storm water from the Mildred-Frederick Street area. 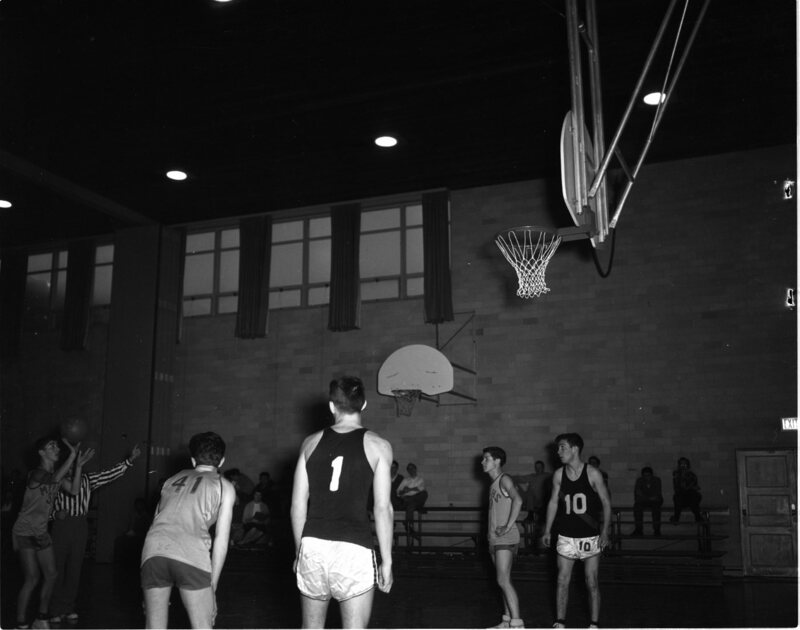 Free Press Herald headline of January 28, 1959; Service Groups Endorse Recreation Council Plan. A six-man steering committee, headed by Rev. J. L. Self, was named Monday night to approach Midland organizations and obtain names of their representatives to be included in a list of nominations for a proposed revitalized recreation council. The committee is to submit its list of nominees at the Feb. 9 meeting of Midland council, along with its recommendations so council can make appointments to a recreation council. The six men, Rev. J. L. Self, Stewart Holt, Frank Spence, Don Galivan, Frank Doherty and Ed Walker, were named at a joint meeting of members of council, and representatives of the Legion, YMCA and Y’s Men’s, Rotary, Lions and Kiwanis Clubs, Jaycees, and the band committee. County Herald headline of January 30, 1959. Million Mark Exceeded in 1958 Building Boom. 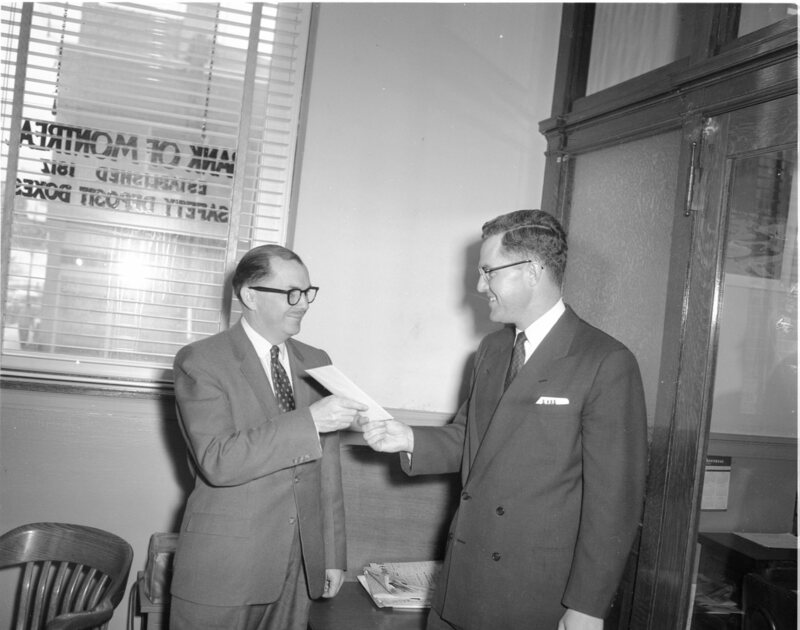 Midland Building Inspector W. F. Turnbull has announced this week that permits issued for construction in Midland in 1958 exceeded the total for 1957 by more than half a million dollars. Mr. Turnbull’s annual report shows that the total value of permits issued last year amounted to $1,268,760. In 1957, the total amounted to $748,650. A total of 118 building permits were issued last year compared with 96 in 1957, Mr. Turnbull revealed. Top month in 1958 was February when the two permits amounted to $394,000. The second highest month was November when 19 permits sent the total to $180,850 for the month. Major building constructed in Midland last year was the new Pillsbury Canada Limited cake mix and refrigerated food plant. Acting on the advice of the police chief and chairman of the police committee. Midland council last week turned down a proposal from the St. Andrews Hospital Board that four members of the police department operate the ambulance service. Police Chairman James Mackie said he had discussed it with Chief Cameron and the chief had stated that one section of the standing orders for officers on the force forbid it; that no officer is permitted to take any job other than the one he is engaged to do. The chief felt it would complicate the whole schedule of police operations, especially where officers were called out on night runs in the ambulance, Mr. Mackie said. Midland council last week gave its endorsement to a proposal to construct a yacht mooring basin in the west end of Midland Bay. The endorsement was contained in a motion requesting the federal minister of public works to give his attention and support to the construction of the basin. The motion further requested that terms of a lease between the town and yacht club for the property at the west end of Midland Bay be drafted for approval. Before endorsing the motion, councillors emphasized they would do so, as long as no cost to the town was involved in the construction of the mooring basin. While it has nothing to do with the visit of the royal yacht Brittania July 4, there is a possibility that dredging may be carried out at Port McNicoll this spring. An engineer from the Department of Public Works, Ottawa, has made a number of soundings, in the outside channel as well as in the slip, Bert Armstrong, superintendent of the CPR elevator, said this week. ELMVALE NEWS— Mr. and Mrs. Walter Draper celebrated their golden wedding anniversary Jan. 13. They have two daughters, Dorothy at home, and Mrs.W. J. Everett (Missie) of Whitby. Mr. and Mrs. H. V. Carnahan spent a few days with relatives in Barrie. Mr. and Mrs. George Terry and Billie spent the week in Toronto with friends. Mrs. Alvin Archer spent Wednesday in Toronto. Elmvale-Flos Volunteer Fire Brigade held its annual meeting with 18 members out of 20 attending. The officers for 1959 are as follows: president, Harry Rowley; vice-president, Stanley Ritchie; secretary, Ross Hutchinson; treasurer, Leslie McKay; auditors John Ferguson, George Pearson, Jerry Reynolds. Accounts amounting to $27.86 were paid. It was reported that $194.25 was the net profit realized from a contest. A committee composed of Jerry Reynolds, Harry Rowley, and Elgin Ritchie was named to purchase some furniture for the meeting room. The sum to be spent was not to exceed $195. The treasurer reported a donation of $25 was received from John Watson in appreciation of efforts of the fire brigade when called to his new store. LAFONTAINE NEWS — Mr. and Mrs. Pierre Desroches, Elliot Lake, visited Mr. and Mrs. Constant Desroches and Mr. and Mrs. Herby Robitaille and relatives. Mr. and Mrs. Armand Corriveau, Penetang, spent the weekend at the home of Mr. and Mrs. Marcel Corriveau. Mrs. Alfred Marchildon’s efficiency homes at Thunder Beach will be called “Happy Hill Homes”. Normal School students, who were teaching in the vicinity, have returned to Ottawa. They are Miss Yvonne Maurice, Miss Therese Moreau, Miss Rosita Robitaille, Miss Rosita Maurice, Augustin Desroches, and Viateur Laurin. Philippe Gervais and Robert flew from Malton airport to Windsor where they will visit Augustin Gervais. A meeting of the Circle Lacordaire and Ste. Jeanne d’Arc was held in the school hall last Wednesday night. The new committee presided for the first time. They are president, Lionel Maurice, son of Mr. and Mrs. Gerard Maurice; vice-president, Benoit Laurin, son of Mr. and Mrs. Hormidas Laurin; secretary, Urbain Maurice. Rev. Sr. St. Urbain has returned from Montreal. No one can accuse Coldwater councillors and reeve of being in municipal politics for the money. The village council must be one of few councils in the province, if not the only one, that is serving without remuneration. YMCA News Review by George Le Mesurire – Well, all the clubs are busy with active plans for the new season. The hobby clubs are working towards the annual hobby show in March, the physical department is working hard on the April gym show, and the Phiat and Phalanx Clubs are planning a variety show in May. GIRLS’ CRAFT CLASS with the assistance of Arlene Armstrong, the girls’ craft classes are working on shell craft, making brooches and earrings. The groups meet Saturday mornings after gym classes. Some of the work of the girls will be on display at the hobby show. PHYSICAL DEPARTMENT Entries are now coming in for the table-tennis series so don’t forget the deadline is Jan. 31. It’s open to all boys and girls 9 and over and men 16 and over. The gym classes are taking on a new look now. Lois Cowan is providing piano music for the gym show routine. Let’s give Lois our full support by coming to classes on time. Boys should be at the ‘Y’ at 6:30 sharp on Fridays, and girls at 9 a.m. Saturdays, Arlene Armstrong is instructing girls 12 and 13 in basketball at 11. Floor hockey results to date; Golden Eagles with 65 points, Mustangs, and Stampeders both with 58, and the Satellites with 51. AFRICAN VOYAGE On a cold winter night this week, members of the Phiat and Phalanx Clubs heard Chris Thompson, of the high school, speak on his tour of Africa. The talk was well illustrated and enjoyed by members of the two clubs. TIP-IN SPORTS Foot comfort, which, plays a very important role in one’s game, is something all should consider. It is important whether one plays badminton, soccer, basketball or squash. Each year many players complain about blisters and athlete’s foot. Many ankles are turned and some even broken. If this is your problem, drop into the ‘Y’ and see Lloyd Stackhouse. INDIAN CLUB INCREASES The boys Indian Adventure Club is continuing active with a larger membership at each meeting. The club meets each Monday evening at 7. One of the assistant leaders is Terry Lethbridge. UNAMOTUS HI-Y CLUB Last weekend, members of the Unamotus Club held a special party. More than 30 attended. 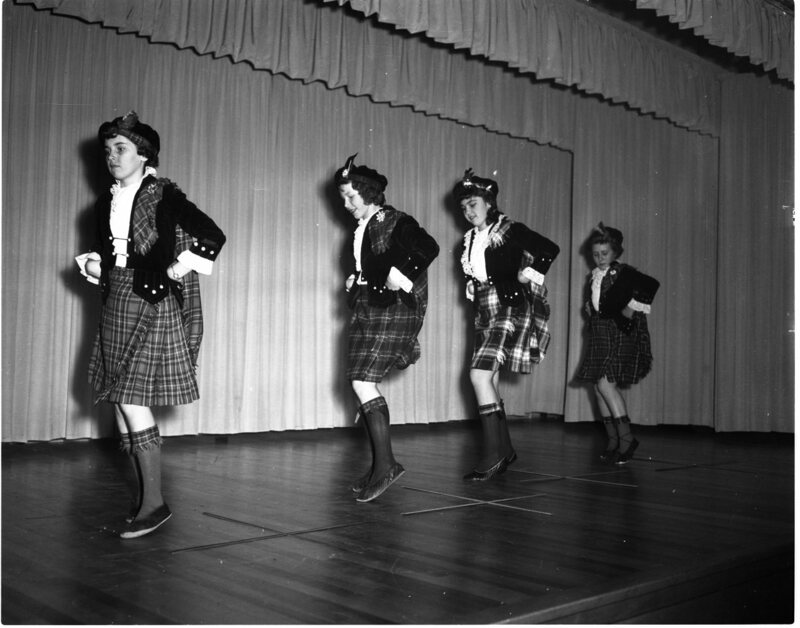 The following night they sponsored a dance for youth, and more than 50 attended. The club will meet with the Barrie Hi-Y Jan. 31 for a joint social evening. NEWS ITEMS The model airplane club has a full membership now and is meeting twice a week to complete projects for the hobby show. — The annual meeting of the Midland YMCA will be Feb. 17. — The radio club is now learning code and radio theory. Members hope to send messages over the air on the night of the hobby show. — Well, that is all for this week, see you at the ‘Y’. Penetang Public School Board this week accepted a tender for construction of a new school building which has been under consideration for some time, according to G. J. Robillard, a member of the board. Tenders had been called and opened about mid-December. But bids given at that time were felt to be far out of line, and a recall was ordered by the board, with changes in specifications. Robillard said the figures considered in the latest tender were approximately $50,000 lower than the previous price. Recommendation for acceptance of the tender of W. G. Howe (Toronto) Ltd., has been forwarded to the Department of Education for approval. The board does not anticipate any difficulty in this move, and expects word of acceptance in the near future, he said. The Howe firm’s first job in Penetang was the construction of the General Hospital, followed by Georgian Manor, and more recently the completion of the community center building. At present, the firm is working on a supermarket building for Mr. Robillard’s IGA store. Measles headed the list of communicable diseases reported by Simcoe County Health Unit in its report for December. There were 67 cases. Chicken Pox came second with 43 cases. There were 10 cases of mumps and seven of whooping cough, while there was only one case of scarlet fever which brought the total to 128 cases reported to the health unit. “Sandy” Campbell is said to be in satisfactory condition in St. Andrew’s Hospital, Midland, following a serious accident in a basketball game at MPDHS gym last Wednesday. Son of Mr. and Mrs. Alex Campbell, First Street, Sandy collided with a Barrie Central Collegiate player during a junior COSSA game. Rushed to St. Andrews, the young player was found to have sustained a serious kidney injury. Mr. Campbell said Monday that his son is now making good progress but would be kept in hospital for at least three weeks. BIRTHS – KEEFER — To Mr. and Mrs. Harold Keefer, 5 Ontario St., Midland, at St. Andrews Hospital, Thursday, Jan. 22, 1959, a son. LEVACK — To Mr. and Mrs. Norman Levack, 239 William St., Midland, at St. Andrews Hospital, Saturday, Jan. 17, 1959, a son. 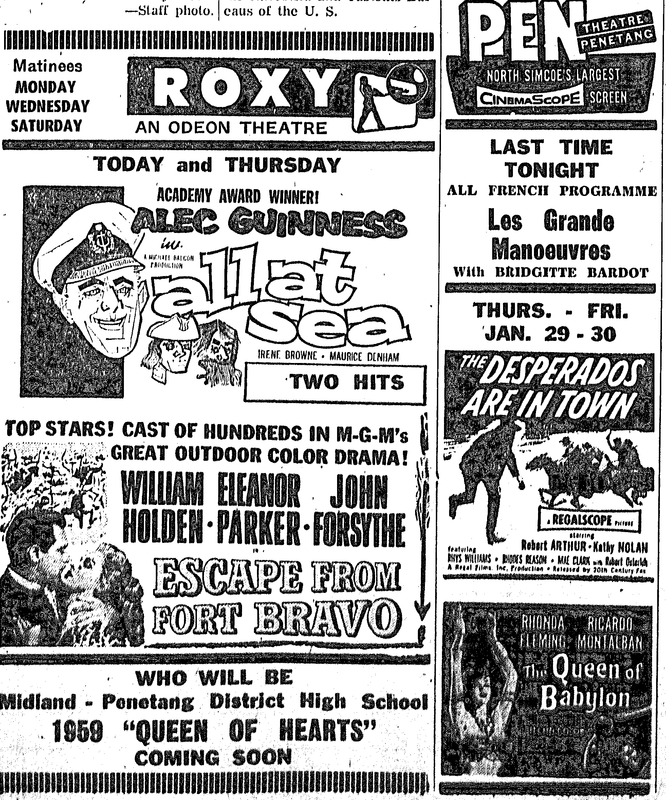 HARPER — To Doreen and Peter Harper, 420 Hugel Ave., Midland, a son, Paul, on Friday, January 23, 1959. Sincere thanks to Dr. Neal and the Staff of St. Andrew’s Hospital. EDWARDS— To Mr. and Mrs. Ross Edward, Port McNicoll, at St. Andrew’s Hospital, Midland, on Friday, Jan. 23, 1959, a daughter. MILLER To Mr. and Mrs. Ross Miller, Waubaushene, at St. Andrew’s hospital, Midland, on Sunday, January 25, 1959, a son. PERRAULT To Mr. and Mrs. Lawrence Perrault, Perkinsfield, at St. Andrew’s hospital, Midland, on Tuesday, January 27, 1959, a daughter. RUMNEY — To Mr. and Mrs. Robert Rumney, R.R. 1, Victoria Harbour, at St. Andrew’s Hospital, Midland, on Tuesday, January 27, 1959, a son. 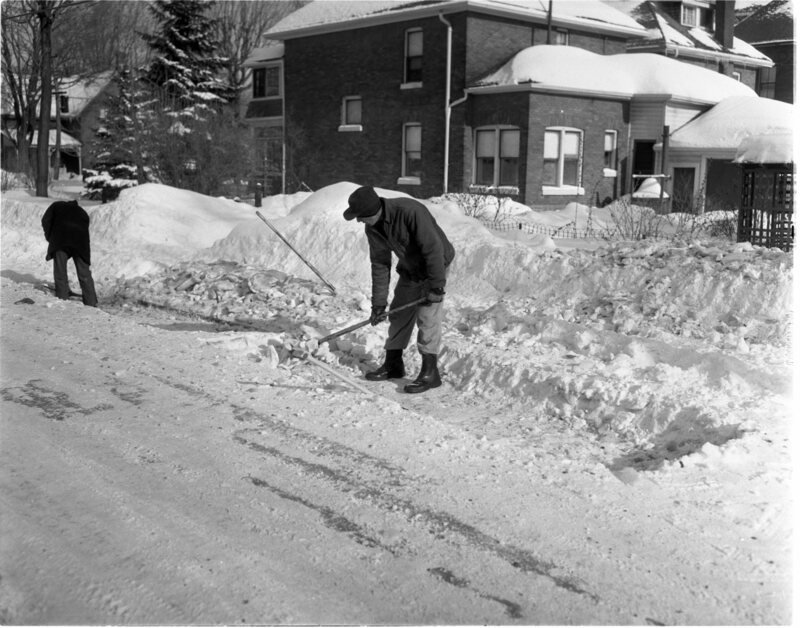 SHAW to Mr. and Mrs. Howard Shaw, 11 Simcoe St., Penetang, at St. Andrew’s Hospital, Midland, on Sunday, Jan. 25, 1959, a son. JONES To Mr. and Mrs. Ross Jones, 108 John St., Midland, at St. Andrews Hospital on Thursday, January 23, 1959, a daughter. For the eleventh consecutive year, citizens of the Midland-Penetang district will have an opportunity to choose a Queen of Hearts. Ten candidates for the queen title were nominated by students at Midland – Penetang District High School Monday. The girls are Judy Bellaire, 52 Chatham Street, Penetang; Gisela Bezner, Sunnyside, Midland; Carol Cowan, 338 Mildred Street, Midland; Annette Ducaire, 51 Chatham Street, Penetang; Marie Gignac, 81 Poyntz Street, Penetang; Anne Hamilton, Penetang Road; Karen Robinson, Victoria Harbour, R.R. 1; Bev Scott, 133 Dominion Ave., Midland; Rosemary Shiels, Waubaushene, R.R. 1; Carol Van Luven, Sunnyside. Preliminary judging will take place at the Roxy Theater Feb. 5, when five of the contestants will be eliminated. Finals and the selection of the new queen will be Feb. 13, the day before St. Valentine’s Day. Obituary – MARY WINNIFRED BELL A past president of St. Andrew’s Hospital Auxiliary and of the ladies’ section of Midland Golf Club, Mrs. Mary Winnifred Bell, a Midland resident for 41 years, died in St. Andrews Hospital, Jan. 12, in her fiftieth year. The funeral service, held at Knox Presbyterian Church, was conducted by Rev. J. L. Self, Jan. 14. Pallbearers were; Dr. C. Swan, J. W. Watson of Hamilton, J. A. Thomas, R. A. Cowan, Orme Johnson and Guy Buchanan of Toronto. Born at Beaverton, the former Mary Winnifred Walton, she married the late Frederick H. Bell in Midland, Oct. 15, 1938. Her husband predeceased her in January 1957. Mrs. Bell is survived by a son, Stephen, her father, George Walton, and a brother, Charles Walton, all of Midland. Burial was in the Lakeview Cemetery Vault.